To promote proper pit bull ownership and responsible rescue through community partnerships, education, and positive training. 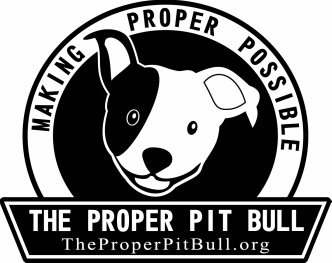 The Proper Pit Bull is an all volunteer and foster based organization. Our Founding Members and Volunteers are located all over Western Pennsylvania; therefore, we can cast a wide net in accomplishing our Mission in helping those in need. We believe that placement is only one piece of the puzzle in helping these dogs, that is why our initial focus is predominantly on education, advocacy, outreach and community partnerships and retention - keeping good dogs in great homes! Our Scholar Pit Program is a resource and service to keep dogs that may be having training issues in their homes and out of shelters. Our Pit Bull Direct and our Pit Bull Professionals are available as a resource for anything and everything pit bull related. And our Outreach Program is there to create strong relationships with other rescues and organizations that have a comparable Mission and want to make our "backyard" better for pit bulls and all animals. And that is what makes us different and unique. We pride ourselves on our partnerships and together we will make a difference!